I believe that web evaluation must be a simple process that can also be applied to memory. Thus the reason for my (A-G) approach. This series is devoted to teaching these skills and I have spent hours preparing resources that you are free to use. I have divided this series using my A-G approach. Please, if you ever have the opportunity, visit me at one of my conference presentations, check out one of my webinars, or invite me to your school district to help inform your entire faculty. It really is time to help kids understand that there are no whales in Lake Michigan, the Southwest Tree Octopus is nonexistent, study of cats and bearded men did not really happen, moon creatures failed to film the lunar landing, and Columbus was not born in Australia. Please enjoy, share, and use! Good research depends on the ability of the researcher to know exactly what the purpose of his research is. One must determine if the website being evaluated provides for the needs of that purpose. A biased site could be useful if it provides valuable arguments and defendable facts that assist the researcher in his mission. Writing a fair and balanced paper may require quotes that represent both sides of an issue. Knowing one’s purpose is possibly the most important idea to investigate before seeking information from the internet. purpose of the website being evaluated. Determining this may mean getting more information about the author/sponsor. It may also demand that the researcher dissect the domain URL seeking information regarding sponsorship, website type, and country of origin. Detecting bias or sensing commercial activity does not automatically mean that a website is not proper for research. The important point is that the researcher becomes aware, as much as possible, of the purpose and reason for a website’s existence. 2. What Is Your Purpose? – Along with determining what may either be an obvious or hidden reason for a website’s existence, good researchers must also be aware of their own research related needs. Whether it be for personal satisfaction, or an assigned task at school or work, the goal of intended research must be clear. The vision created for research must be kept in mind and be the object of constant focus. By practicing this, a researcher will keep on a straight path toward the targeted vision of purpose. This allows the researcher to avoid the pitfall of a lack of productivity that comes from distraction by websites that could be interesting, filled with information, and enjoyable to investigate, but do not satisfy the researcher’s purpose. 3. Do They Complement Each Other? 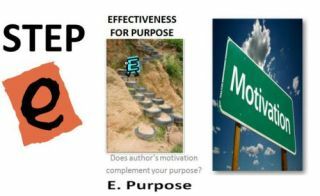 – This is the all important concept that guides a researcher through the idea of “effectiveness for purpose.” Being aware of one’s research needs and weighing those needs with the perceived purpose for a webpage’s existence is a key to proper research. Even an opinionated or biased page may assist a researcher. Such a website could be valuable in the pre-search stage as the researcher is beginning to learn more about a subject. It can provide information for further verification of information, supply arguments that allow two sides of an issue to be debated, or possibly giver the researcher concepts that can be supported or rebutted. It is still important to use other reputable sites to verify facts. Understanding the power of using a website that complements research needs and gauging “Effectiveness for Purpose” will bring success to any research effort. Enjoying the series?… Please let me know by email, response, and sign up… and please share with a Retweet!